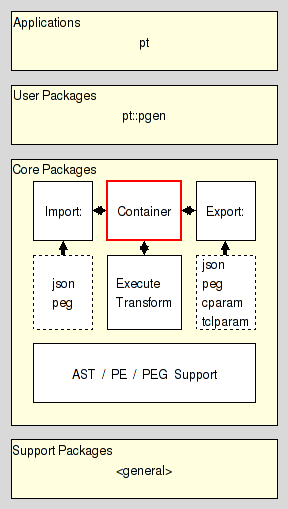 pt::peg::container(n) 1 tcllib "Parser Tools"
This package provides a container class for parsing expression grammars, with each instance storing a single grammar and allowing the user to manipulate and query its definition. It resides in the Storage section of the Core Layer of Parser Tools, and is one of the three pillars the management of parsing expression grammars resides on. This package provides an implementation of PARAM, a virtual machine for the parsing of a channel, geared towards the needs of handling PEGs. The command creates a new container object for a parsing expression grammar and returns the fully qualified name of the object command as its result. The API of this object command is described in the section Object API. It may be used to invoke various operations on the object. The new container will be empty if no src is specified. Otherwise it will contain a copy of the grammar contained in the src. All operators except deserialize interpret src as a container object command. The deserialize operator interprets src as the serialization of a parsing expression grammar instead, as specified in section PEG serialization format. An empty grammar has no nonterminal symbols, and the start expression is the empty expression, i.e. epsilon. It is valid, but not useful. This method resets the object to contain the empty grammar. It does not destroy the object itself. This method returns the import manager object currently attached to the container, if any. This method attaches the object as import manager to the container, and returns it as the result of the command. Note that the object is not put into ownership of the container. I.e., destruction of the container will not destroy the object. This method returns the export manager object currently attached to the container, if any. This method attaches the object as export manager to the container, and returns it as the result of the command. Note that the object is not put into ownership of the container. I.e., destruction of the container will not destroy the object. This method assigns the contents of the PEG object source to ourselves, overwriting the existing definition. This is the assignment operator for grammars. This method assigns our contents to the PEG object destination, overwriting the existing definition. This is the reverse assignment operator for grammars. This method returns our grammar in some textual form usable for transfer, persistent storage, etc. If no format is not specified the returned result is the canonical serialization of the grammar, as specified in the section PEG serialization format. Otherwise the object will use the attached export manager to convert the data to the specified format. In that case the method will fail with an error if the container has no export manager attached to it. Otherwise the object will use the attached import manager to convert the data from the specified format to a serialization it can handle. In that case the method will fail with an error if the container has no import manager attached to it. This method behaves like deserialize = in its essentials, except that it merges the grammar in the data to its contents instead of replacing it. The method will fail with an error and leave the grammar unchanged if merging is not possible, i.e. would produce an invalid grammar. This method returns the current start expression of the grammar. This method defines the start expression of the grammar. It replaces the current start expression with the parsing expression pe, and returns the new start expression. The method will fail with an error and leave the grammar unchanged if pe does not contain a valid parsing expression as specified in the section PE serialization format. This method returns the set of all nonterminal symbols known to the grammar. This method returns a dictionary mapping the set of all nonterminal symbols known to the grammar to their semantic modes. This method takes a dictionary mapping a set of nonterminal symbols known to the grammar to their semantic modes, and returns the new full mapping of nonterminal symbols to semantic modes. The method will fail with an error if any of the nonterminal symbols in the dictionary is not known to the grammar, or the empty string, i.e. an invalid nonterminal symbol, or if any the chosen modes is not one of the legal values. This method returns a dictionary mapping the set of all nonterminal symbols known to the grammar to their parsing expressions (right-hand sides). This method takes a dictionary mapping a set of nonterminal symbols known to the grammar to their parsing expressions (right-hand sides), and returns the new full mapping of nonterminal symbols to parsing expressions. The method will fail with an error any of the nonterminal symbols in the dictionary is not known to the grammar, or the empty string, i.e. an invalid nonterminal symbol, or any of the chosen parsing expressions is not a valid parsing expression as specified in the section PE serialization format. This method adds the nonterminal symbols nt, etc. to the grammar, and defines default semantic mode and expression for it (value and epsilon respectively). The method returns the empty string as its result. The method will fail with an error and leaves the grammar unchanged if any of the nonterminal symbols are either already defined in our grammar, or are the empty string (an invalid nonterminal symbol). The method does nothing if no symbol was specified as argument. This method removes the named nonterminal symbols nt, etc. from the set of nonterminal symbols known to our grammar. The method returns the empty string as its result. The method will fail with an error and leave the grammar unchanged if any of the nonterminal symbols is not known to the grammar, or is the empty string, i.e. an invalid nonterminal symbol. This method tests whether the nonterminal symbol nt is known to our grammar or not. The result is a boolean value. It will be set to true if nt is known, and false otherwise. The method will fail with an error if nt is the empty string, i.e. an invalid nonterminal symbol. This method renames the nonterminal symbol ntold to ntnew. The method returns the empty string as its result. The method will fail with an error and leave the grammar unchanged if either ntold is not known to the grammar, or ntnew is already known, or any of them is the empty string, i.e. an invalid nonterminal symbol. This method returns the current semantic mode for the nonterminal symbol nt. The method will fail with an error if nt is not known to the grammar, or the empty string, i.e. an invalid nonterminal symbol. This mode sets the semantic mode for the nonterminal symbol nt, and returns the new mode. The method will fail with an error if nt is not known to the grammar, or the empty string, i.e. an invalid nonterminal symbol, or the chosen mode is not one of the legal values. This method returns the current parsing expression (right-hand side) for the nonterminal symbol nt. This method set the parsing expression (right-hand side) of the nonterminal nt to pe, and returns the new parsing expression. The method will fail with an error if nt is not known to the grammar, or the empty string, i.e. an invalid nonterminal symbol, or pe does not contain a valid parsing expression as specified in the section PE serialization format.